Remember back with mousse #1, where I discussed how eggs enriched a mousse like nothing else? The only issue was that the eggs in the classic French style mousse weren’t cooked, so it should be avoided by those with health concerns. However, the next two mousses use eggs that are cooked, so you don’t have to worry about anything – except perhaps your waistline! I think they’re worth the extra effort. This mousse uses the classic creme anglaise as a base. Folded into the melted chocolate, and then lightened with whipped cream, it totally captures the rich-yet-airy paradox, especially when fresh. Not surprisingly, the creme anglaise gives the mousse a very full and creamy mouthfeel. I found as I was making these mousses that it was really hard to wait for them to set up: I pretty much wanted to eat them straight out of the mixing bowl. Freshly made mousse has the softer, more pudding-like consistency that some people seem to associate with mousse, rather than the firmer, denser product that results from a few hours of chilling. 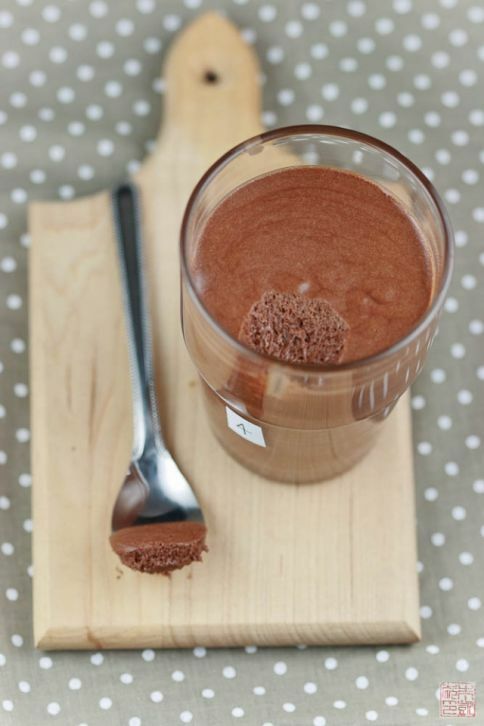 This mousse tastes similar to the chocolate chantilly mousse (#3), and it also has the same dense, thick texture right out of the refrigerator, but allowing it to come to room temperature brings back its lovely creaminess. It also works really well as a dessert component, either as a layer in a chilled cake or as part of a composed dessert. Another thing to note is that the higher cacao percentage you’re using, the drier and denser your mousse will be. So choose your chocolate accordingly. You can also adjust the mousse consistency by adding more or less whipped cream at the end – for eating, most people as I noted seem to go for a softer mousse, so you could add more. For assembling a dessert, you want it to a little more structure and be able to stand firm, so cut back a bit on the whipped cream. The main thing to watch out with this mousse method is to not overcook the creme anglaise, which leads to a curdled mess. Don’t let the mixture come to a boil – it should be about 180 degrees F when it thickens enough to coat the back of a wooden spoon. You should also keep stirring while the custard is cooking, to make sure the part at the bottom doesn’t cook faster and start sticking to the pan. Some creme anglaise recipes also use extra measures like straining the cooked custard to get rid of any lumps, or immediately plunging the pan into an ice bath to stop the cooking. Cooking with Chocolate suggests using an immersion blender to make sure the custard is completely smooth. Any of these methods can help keep your custard silky smooth. 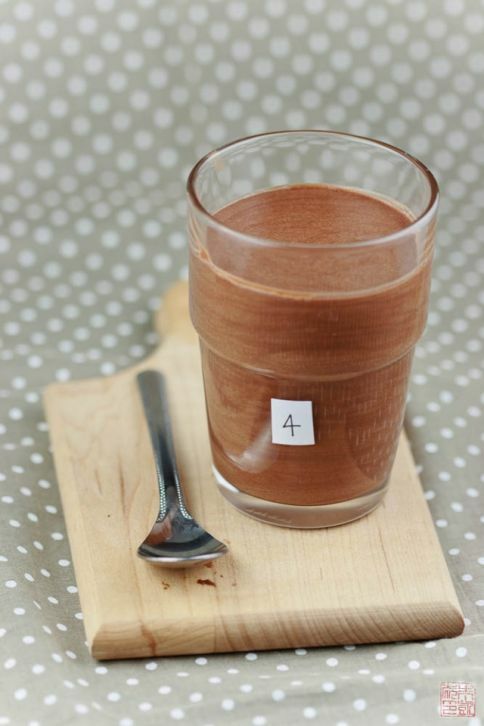 If you’re attempting your own mousse comparison at home, I’d recommend doing #1, #2, and #4 at least – these three provide a really good range of textures and chocolate intensity, and you might be surprised at which one is your favorite. There’s still one more style I have to cover, though, so stay tuned! Make the creme anglaise: combine egg yolks and sugar in a large saucepan and beat until combined. Add milk and 2/3 cup whipping cream to the mixture, and bring to a simmer over low heat. Let thicken until it coats the back of a wooden spoon. Pour custard into a large mixing bowl. Process with an immersion blender to get rid of any lumps. Slowly pour about one-third of the custard into the melted chocolate, stirring to combine. Pour in another third of the custard and stir to combine. Add the remaining custard and stir to combine. Place 1 3/4 cups cream in bowl of a stand mixer and whisk with the whisk attachment until soft peaks form. When the chocolate mixture has cooled to 113-122 degrees F, fold in the whipped cream with a flexible spatula. they have all looked good, but this one looks the best so far! I’m looking to make a chocolate mousse pie. Which of your recipes would yield the best pie? I want to make a few! 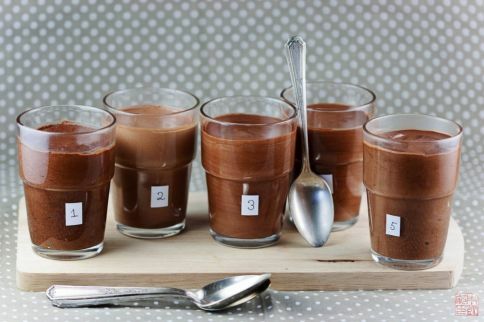 I would vote for mousse #2, the milk and chocolate mousse, or perhaps #5, the sabayon one. Happy baking!